The name of this boat is its least memorable feature; it deserves something more gripping than AMF 610. But just about everything else about it stays in the mind without any problem: its strength, seaworthiness, deceptive simplicity and its sheer practicality. New Zealanders tend not to have many sophisticated boating accessories like ramps, so launching is often a matter of hurling the boat into the surf or sliding it over a riverbank. Hence the 6mm plate bottom and the 12mm keel of the AMF, and its immensely strong fore and aft framing system. And, when you look closer, almost everything about its structure. This boat is built to a system that involves torturing the plates into postures that build-in such stiffness that, if it ever broke up under some unimaginable stress, it would probably explode. On the subject of construction, you will seldom see a boat with welds this beautiful. Possibly it was a wish to display them that caused the builder to be extremely reluctant to bog and paint any of his boats. The standard finish is a lacquer that gives it a distinctive metallic grey hue that has the wonderful property of scarcely showing the minor dings of boating life. The fine print of finish is there too. Run your fingers along the hidden edges of plate aluminium and you will sometimes draw blood. Not here: hidden or on show, everything gets a first class finish. Look long and hard and you will be pushed to find traces of luxury in what is not a cheap boat. But the discerning eye will spot any number of cost centres that make small and large improvements to the overall achievement. Reinforcing pipe sections have drain holes let in their lower ends to reduce or eliminate corrosion; the windscreen is contained in a frame that would be appropriate in an armoured car, to name a couple. Under way this boat maintains the tough-guy image. We searched out and found lumpy stuff, wakes and the like, and it laughed at us. We drove at everything at stupid speeds and the result was the same: the AMF just soaked it up. Which is all to the good, but the point is whether it is what you need. If you are the kind of fisherman who just wants to get out there regardless of the conditions, this could be your boat. It has a lot of hairs on its chest. If you have cruising in mind, as the builders halfway suggest, it is all a bit different. Perhaps NZ cruising is more rugged than we are used to, but just about the only concessions to comfort are a pair of bunks, at 1.8m just about useable. They are in a lined cabin equipped with a large clear fore hatch and a half bulkhead. This of course is reinforced and seam welded to add stiffness to the structure. The seats are a pair of removable pedestals – many New Zealanders order their boats without them; they want maximum fishing space and generally do not have to travel far to find fish. A cantilevered Bimini carried on a folding Targa – another item only for pampered Aussies – provides a good area of shade. The seats are provided with footrests, cave pockets for oddments, and a vast area on top of the dash guarded by fiddle-grab rail for bigger items. Like the side pockets it is carpeted for quietness and friction. That accounts for all the seats, although at slow speeds the wide side decks are comfortable enough for the job. They are wide partly for the strength they add, and partly probably to move anyone standing to fish a bit further inboard. The AMF has a lot of deadrise, and its slightly narrow beam and that control of weight are ways of adding stability. 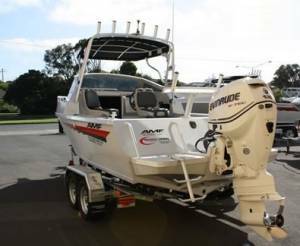 The AMF is rated for a maximum 150hp and the review boat was close with a 140 Suzuki four-stroke. It is fed from a 160L tank that is slightly on the small side by local standards. For trips needing more, AMF have supplied a device that allows you to connect a couple of auxiliary tanks. The auxiliaries feed into the main tank and the motor continues to draw from there. For its size the AMF is a fairly heavy boat but the Suzuki made short work of it, and with 20 or 30hp less probably still would. It is a precise boat to drive and good fun – and very quiet, due probably to its great stiffness. The AMF is a boat so tough your grandkids could inherit it, and they could pass it on to a couple more generations. It is also very practical, and to most eyes good looking.